iOS 10 will include updates for a number of Apple's apps, including Maps, Phone and Messages. During its WWDC 16 keynote Monday, Apple unveiled iOS 10, the next version of its iOS operating system. Apple described iOS 10 as “the biggest iOS release ever,” and it will include updates for a number of Apple’s apps, including Maps, Photos and Messages. The Messages app will be updated with larger emoji, message animations, handwritten notes and more. Users will be able to send animated text bubbles, as well as messages with full-screen animations, such as balloons and confetti. Users will also be able to send messages with “invisible ink,” which hides messages until recipients swipe over them. In addition, users will be able to automatically replace supported words with emoji. Finally, a new Tapback feature will allow users to quickly respond to specific messages with a tap. The Maps app has been opened to developers, which will allow developers to integrate new features into the Maps experience. For instance, ride-sharing services like Uber and Lyft will be able to allow users to book rides without leaving the Maps app. In addition, while traveling to destinations, users will be able to search along their travel routes for gas stations, restaurants and other locations. The app will provide estimates for how each stop will impact the lengths of their trips. The Photos app will be updated with Memories, a feature that will scan a user’s photos and videos and create collections related to specific events. Each Memory will contain a Memory Movie, an automatically created movie with theme music, titles and cinematic transitions. The Apple Music app will be redesigned to make it easier for users to navigate and discover new music. The Library, For You, Browse and Radio tabs have been redesigned, and a Search tab will help users find music easier. The News app will be updated with a redesigned For You tab, which will organize content into sections based on topics. The updated app will also support subscriptions. In addition to these updates, Apple revealed new Home and Swift Playgrounds apps. The Home app will allow users to manage and control their home automation products individually, or by grouping them into “scenes.” Meanwhile, the Swift Playgrounds iPad app was designed to help children learn to code. 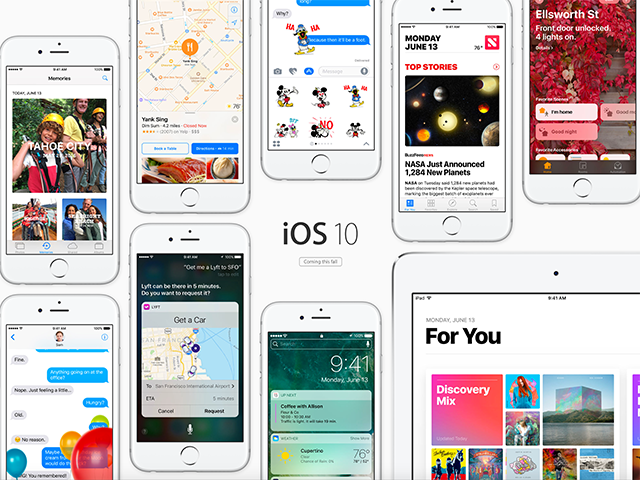 iOS 10 is our biggest release ever, with delightful new ways to express yourself in Messages, a native app for Home automation and beautifully redesigned apps for Music, Maps and News that are more intuitive and more powerful, making everything you love about your iPhone and iPad even better. iOS 10 adds Siri intelligence into QuickType and Photos, automates your home with the new Home app and opens up Siri, Maps, Phone and Messages to developers—while increasing security and privacy with powerful technologies like Differential Privacy. The developer preview of iOS 10 is available to iOS Developer Program members now. A public beta program will launch in July, with the full launch of iOS 10 coming this fall.